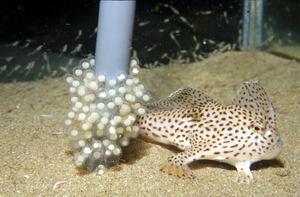 A female spotted handfish in laboratory aquarium with fully developed embryos one day before hatching. Handfish are being bred in captivity as part of a federally-funded recovery plan led by CSIRO Marine Research. Photo credit: Mark Green, CSIRO Marine Research. Photographer : Mark Green, CSIRO Marine Research.